For Rocky Geans, president of L.L. Geans Construction Co., success is measured not just in sales, but also in running his company efficiently and building client trust through solid service. "Bigger isn't always better," Geans says. And he should know. He's grown his family-owned business, which started in 1959, expanding the company's residential and commercial services as well as its products. Along the way, he's run into a few issues familiar to a lot of people running a family-owned operation. "Some (members of the family) felt a certain amount of entitlement," Geans explains. "Their expectations were wrong, I wasn't here to be their buddy." He adds that although other family members may be knowledgeable about the work being done, they are not always as knowledgeable about running a business itself. Geans says he's employed family members who embody both ends of the spectrum (from hard-working to hardly-working), and he is happy to report that all family members currently employed by the company are both quality-minded and honest. Geans says that description is equally appropriate for the rest of his crew. "I'm so proud of my employees in the field," he says. "I appreciate them – without them we would have nothing." Geans recognizes that he has a lot, including a business that services both residential and commercial concrete applications. The company works on industrial construction projects including loading docks, machine pits and bases, and floor repairs in factories. They also offer decorative concrete work -- including stamping and staining -- for residential and commercial sites. Along with decorative work, they repair and replace residential concrete. His company has built a solid reputation on honesty and hard work. To help transition that reputation into "marketingese," Geans worked with a marketing firm to develop his tagline, "Building your trust with solid service." To exemplify that motto, Geans explains that every job site his company works on is cleaned every day "as if we're not coming back – even though we are," and that there's always constant communication with customers. "We pride ourselves on service, service, service," he says. "One of our objectives is to thoroughly investigate problems before trying to solve them. It goes hand-in-hand with our company's philosophy to be honest, work hard, take pride in what we do, and work to please the customer," Geans adds. In order to provide the best service possible, Geans constantly looks to industry experts and colleagues for the exchange of information. A regular at the World of Concrete (WOC) since 1973, Geans says he's been known to attend the same seminar more than once because each time he learns new things and is able to apply that knowledge to other areas of his business. Geans was instrumental in developing the CEO Forums, another great way for concrete industry leaders to exchange ideas and information, for the American Society of Concrete Contractors (ASCC). He also helped develop the more recent Management Information Exchange (MIX) Groups. MIX Groups, usually consisting of six to 10 contractors from different geographic areas, come together every six months at one of the member's locations to "turn (one member's) business upside down." "It's amazing what we learn from each other," Geans says. "In those days, we are married to each other and we change everything." There are currently five active MIX Groups in the ASCC, and joining is as easy as indicating interest. Those who are interested then attend a meeting on how to have a MIX Group, and graduate by forming one of their own. "When I hear about a contractor who has picked up an idea from another contractor that saved him $50,000 a year, I'm elated," says Geans regarding why he's involved. Geans also conducts two seminars at the WOC, but he got his start conducting seminars in a very unusual way. In a pinch, he filled in for a speaker on the fly at WOC years ago, delivering a safety presentation at the last minute. He was asked back the next year to participate in a seminar on concrete flatwork. The next year he was asked to present a solo seminar, and the rest is history. "People that really know what they're taking about will help others," Geans says. "I enjoy helping others avoid the mistakes I've made." For Geans, the benefits of participating in seminars at WOC and the MIX Groups are two-fold. "I get to know everybody, and the networking is what helps contractors approach each other for help, and there's also a synergy of learning." 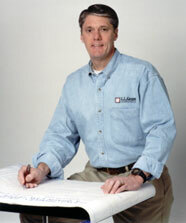 Geans has been learning for a long time, coming up the ranks in the industry over the years. His passion for concrete stems from the fact he grew up in the business, but he gets his motivation from those around him. "I appreciate the men in the field because that's how I came up," Geans explains. He adds that one of the most beneficial seminars he ever attended had to do with the different ways people learn. Since everyone learns differently, he adds, "Don't be afraid to ask questions. And asking questions is going to become more and more important as the industry advances. When Geans predicts the near future of the industry, he says he wouldn't be surprised to see a certification required for decorative concrete work in the near future. He adds that as there is more communication with the technical industry, he sees contractors having more say in all areas of the concrete industry. And with the continuing labor shortage and the fact that today's consumers are more meticulous and savvy, "Quality is going to continue to tighten up," adds Geans. Which explains why the most important part of the L.L. Geans pledge to their customers is, "We will consider the project completed only upon final inspection and approval by you."